Hello! What a crazy couple of weeks it's been. I feel like mid-December through mid-January has been a complete blur. Birthdays, holidays and a cold that wouldn't quit led me right in to TNNA and the Spring knitting season. I just got back from the annual Spring TNNA trade show for wholesale yarn companies to exhibit and meet yarn shops from across the country. The wholesale companies have booths and the retailers get to shop their hearts out. It's always so fun to see familiar faces and meet tons of new ones. Here's my adventure for Ewe Ewe Yarns sixth TNNA show! I left San Diego at the break of dawn on Friday. It was a great flight out and Phoenix is a quick hop so I felt like I was there in no time. Phoenix was warm ans sunny and all set up for TNNA. There were cute posters leading us around the convention center. Friday we worked to set up the booth and get everything ready for show time. Then on Friday night we had Sample It! Which is a great event where retailers can get a pre-show of what's new and even buy samples! It was our first time trying Sample It and it was a TON of fun! It's a big room full of knitters buying nothing but the newest yarns on the market. Needless to say, things get pretty crazy! At moments it has the energy of a frantic bridal sale but then you see someone you know and it's all hugs. I'm happy I finally tried it! Then before you know it, it's Saturday morning and that means show time! Everything is set and ready to go. Catalogs, order forms, new scarves, sweaters and smiles! There's lots of new knitting patterns hiding on these tables. We'll be releasing them all in just the next couple of weeks! So much fun! Like this beauty! 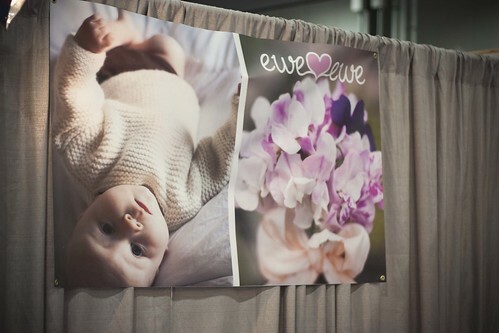 It was a big hit at the trade show and we're excited to say that our new shawl, Rainbows & Unicorns comes out tomorrow! It features all the colors, an entire rainbow of Ewe So Sporty yarn. Woohoo! Thanks, as always for a great TNNA trade show. We just got back from TNNA, the yarn industry trade show. This summer Ewe Ewe has lots of new things to share like 8 new colors of Wooly Worsted merino yarn! You can see a couple of them peeking out in this photo... more details are coming soon! 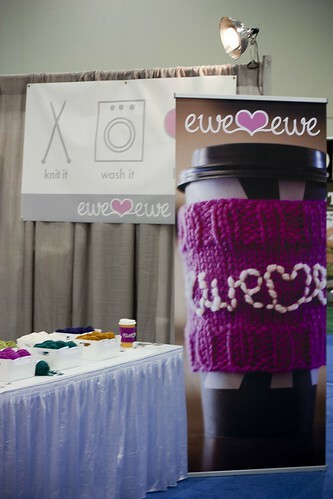 Ewe Ewe had a great weekend at our second TNNA trade show. This time the show was in Phoenix and I really had a great time! Phoenix was a fun city and it was nice to see another western city outside of California for a change. This time around we did a fun space age theme in the booth with lots of hanging yarn balls and dreamy heart of knitted i-cord dangling over our focal point garments. Wooly Worsted gave a good display, the colors are all so bright and happy! 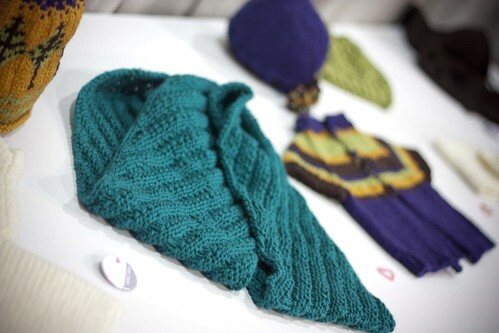 People were drawn into the booth to ooh and ahh and have a squeeze of our super soft squishy yarn! We gave away cute little sample hanks. The yarn store owners were like a kid in a candy store when we let them pick a few to take to knit! And everybody loved our heart garland that with the Ewe Ewe Heart Heart free knitting pattern from last week. We knit tons of those little hearts and strung them on fishing line to make a perfectly sweet decoration. All in all the show was great! 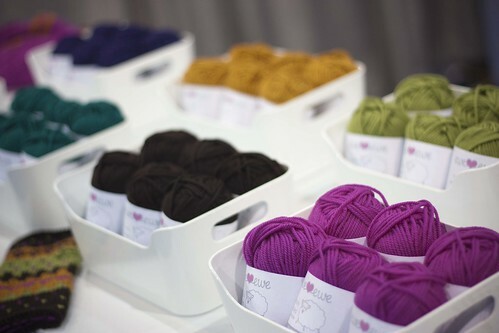 Ewe Ewe is coming to new yarn shops across the country very soon! Stay tuned! We did it! 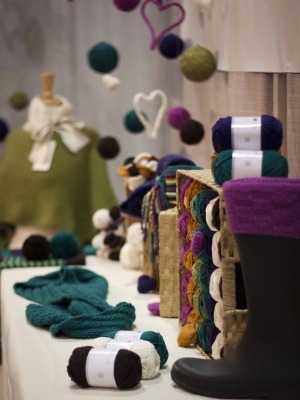 We launched Ewe Ewe Yarns at the TNNA Summer Market and we had a great time. Here's a few photos of our first booth setup. The cute little balls of yarn were the stars of the show. Nothing feels better than luxury merino wool and Wooly Worsted Washable is seriously soft. 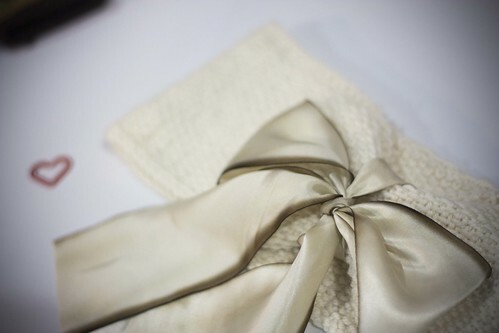 Everyone loved it's cute label, bouncy feel and beautiful sheen. We met so many great people over the long weekend and we can't wait for the next show! And it's a yarn company! I'm getting really excited to head to TNNA, the yarn wholesale trade show, where I'll start taking orders from local yarn stores all over the country. I've put together a great package of patterns and yarn colors and I'm really excited to share it. Our booth is tucked in with some of my favorite yarns like Shibui and Knit Collage. This is one of my banners for the booth... Knit it, wash it, love it! That's what wooly worsted washable is all about. If you're going, be sure to stop by and say hi!